Riverdogs are one of music’s best kept secrets. 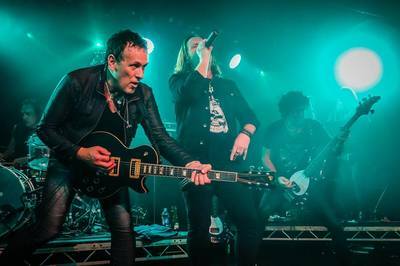 Formed in Los Angeles in 1989, the blues rock outfit were poised for success when guitarist Vivian Campbell left to join Def Leppard. Reforming for 2011’s ‘World Gone Mad’ release, the four-piece are back once again with what they believe is the true follow-up to their self-titled debut. 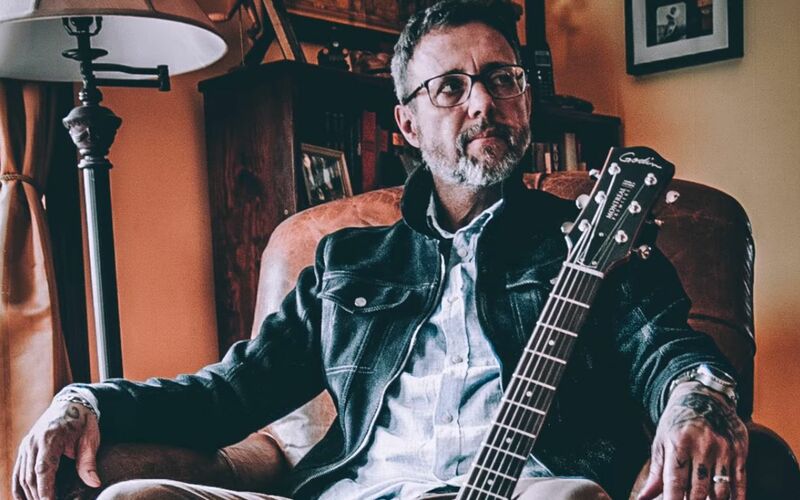 We sat down with lead singer and guitarist Rob Lamothe for a chat about ‘California’, and what it took to get there. Toy soldier; Eamon O’Neill. ​Hi, how are you today? I am bloody great. It’s a beautiful day here in Ontario, Canada. I’ve got no complaints, and the Riverdogs record is the unbelievable, sweet, icing on the cake of this last couple of years. It’s a very warm welcome back to Riverdogs; how did you end up working together again? We’ve all stayed friends for years, even after Viv left the band in 1990, which wasn’t a surprise because we knew that was going to happen unless we started making some money. It’s a typical story where, the week our record came out we had a new president of our label who told us we needed to start thinking about the next record, and our record was just released! So that happened, Viv left, and he ended up joining Def Leppard fairly soon after that. So was friendship at the heart of getting back together? Was it a case of the timing just being right for a 2017 Riverdogs release? I hadn’t really thought about that, but yes, the timing, it just happened to work. We did a conference call, I think it was the end of 2015, and from that initial night, we talked about it. We said; “Can we even do this?” Because Marc and Nick and I are all involved heavily in studio work and we all make a living at it, and Viv is obviously in Def Leppard and Last in Line. So, we had that conversation; yes, we all wanted to do this, but is there any way we could? Viv had a tour break coming up in April 2016, and I could take my vacation at that time, and Nick could leave some space there to get together in Los Angeles, so that’s what we did. So you all met up to discuss making a record together? It was an old school way of working; all of you in a room together, rather than swapping files over the internet? That was the only way we were going to do it. We were not going to make a record where Nick records his parts in Nashville, Mark records his parts in L.A., I do my stuff in studio, or write by email. Bands do it, and I’ve been involved in lots of projects where that is happening, but Frontiers [record company] loved our first record, and they said they would really like to hear something in that direction, and we went; “Oh, that’s a great idea”. The record we had made in 2010 [‘World Gone Mad’] was kind of cobbled together. There’s a couple of songs that we did as a band and they sound so much better than the other songs that were done via the worldwide web. So we had decided that the only way we were going to make it was if we were to get in a room together, and that’s exactly what we did. Did the creation process take place in that environment too? We didn’t have a bunch of songs written before we got together. I brought in a couple of ideas, and literally, 90% of the rest of it came out of Viv’s mind. Listening to tracks like ‘Welcome To The New Disaster’ and ‘Something Inside’; there’s a real organic vibe that possibly could only have been created by getting together. I agree with you, 100%. We didn’t want to do it in a rehearsal room, so we rented a friend’s house in Los Angeles. We just hunkered down for five days, but on both trips, we only took three days. I can’t believe we did it, but in three days we wrote six songs, and on the next trip on three days we wrote six songs, and then we spent the Thursday and Friday getting demo versions recorded at Marc’s studios. There’s a hazy, soulful sound to those tracks. Those songs in particular to me, they have a little bit of a Laurel Canyon sort of vibe; from Crosby, Stills & Nash, or whoever, of the hippies writing music and playing in those old houses up there. Also, I thought a little of the Red Hot Chili Peppers; some of their slower songs, because to me, they’re so identifiable as Southern California songs. I think we picked up on that, and I don’t think there’s any way to get that vibe. We were literally sitting in a circle on those two songs, where we gathered around, and I started making up words that didn’t make any sense and we just found a groove together. Is that where the album title ‘California’ arose from? You know, I think that was just inevitable. I was born and raised in Southern California, and two of my children were born there. To me, California is a state of mind, and I kind of personified it, in a way. On these song writing trips I really got lost in this dreamy reality of waking in the morning, drinking some coffee, and then walking to the studio. I could have grabbed an Uber and got there in five or ten minutes, but I wanted to walk through Hollywood at 10am for thirty minutes, and that’s how I started each day out. It felt really incredible to me; it was like going into a time machine, and I just floated on this cloud of emotion. My older son went on my first trip there, and my daughter Rose came on the second trip. It became this intergenerational thing where I was sharing my youth with my kids. That’s something that is one of the best things to ever happen in my life. It sounds like it was a really personal process for you; is ‘California’ one of the most important albums you’ve been involved with? Yes, I would say that’s absolutely true. For one thing, to get the chance to make another record with Viv and Nick and Marc; this was really important, and really special. Marc wasn’t on the first record, but he toured it, and we all considered ourselves the core of it all, the four of us. 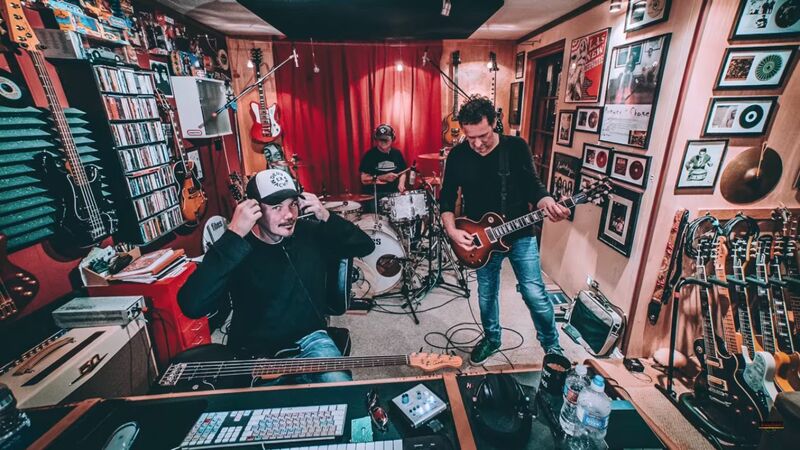 It was great to get the opportunity to go back, and not just make a record but to have a decent budget where you can actually write the songs in the manner you want to write them, and get to record them in the way you want to record them. If we didn’t nail it, it would only be our own responsibility. We had the means to do it the way we wanted to, and we nailed it. You mentioned that 90% of it came from Vivian Campbell; is Viv the main song writer? On the first record, I was the main song writer; I wrote a lot of the music, probably 90% as far as guitar chords, and I wrote all the lyrics. But on this record, it’s interesting because we didn’t do that; I didn’t make any assumptions that after twenty-six or twenty-seven years, I’m going to come in with ten or eight songs and go; “Hey Viv, have you got a couple of ideas?” We shared a couple of ideas ahead of time, but most of the music on this record happened in the room, and it came off of Viv’s guitar. On the first day we kind of looked at each other and went; “We haven’t done this for a few years. What are we going to do? How are we going to do this?”, and from the moment we started, it was just ‘there’, and it was effortless. So that translated easily into the writing sessions? There was no stress, there was no sweating. Viv would just start playing something while he was warming up his amp, and I’d still be having my coffee, and I’d stick my head into the living room and go; “What was that?”, and Viv would go; “Oh, I was just playing this thing”, and I’d go; “Oh my gosh”, and I’d grab my guitar and put my coffee down, and I’d just try and figure out some simple rhythm, Marc would start a little groove, and Nick would pick up his bass, and then we were off to the races. In the video for ‘American Dream’, Vivan seems to be using his first ever Les Paul; the same guitar he used to record the ‘Holy Diver’ album with Dio. That was the guitar that he used on the first Riverdogs record, and it was one the guitars he used on this record. So in a way, Vivian was looking back in much the same way that you were? You’re absolutely right, I never thought about that. But you know, Viv was dealing with his cancer, and that has to enter into your mind. A couple of us had health scares in the last couple of years, and Viv’s was the most serious, and that’s got to make you wonder about the future, and that’s got to make you hopefully appreciate every moment in the present, and to think back. It’s interesting you say that. I’m sure we all probably did that; we made up for some things, or corrected somethings or did something in a new, or more inspired way making this record. Having said that, there’s a lot of water under the bridge; twenty-seven years ago we made that record, and that’s a lot of miles that have gone by. Our kids were around. Marc’s son was taking our photos and shooting some promo video stuff, and Marc’s daughter was at the sessions pushing ‘record’ on the phone that we were recording ideas on, and all three of my kids came on three different trips, and Nick’s son came out to the video shoot. It’s a nice full circle for you, isn’t it? Yeah, it really. We made this record and we paid homage to the first record with the sonics; the sound quality, and the sounds of the amps and the guitars, and drums and vocals. But we update all those ideas; we don’t just recreate the first record. We all felt like if we could do that in a way that we really loved, and loved the songs, that that would be a success, and we did it. And at the end of it, we did what we set out to do, and how often can you say that in the music business? Is it because of the way that the music industry works today, where everyone can be in multiple bands, that makes the Riverdogs existence a possibility? I think so, for sure. Part of it is probably the internet, and technology allows people to do more, for one thing. It’s a great time to be a musician for a living. If you can utilise the technology and thing outside the box, there are careers out there in this field. It has expanded and changed rapidly, and that was the old way – being in a band, you’d never be in a second band. Even going off and playing a couple of gigs with another band could have been threatening to your band. Finally, the big question that people want to know the answer to is; are Riverdogs live shows a possibility, at this stage? Absolutely. To be honest, we had not even thought about that until this last week. It had come up in a conversation when we first started making the record, and as we were moving forward, we just said; “Ah, we’ll just see where things go”. And now there’s been some more serious discussions around that sort of thing. Logistically, it’s a challenge, but we’re looking at the potential of doing some one-off gigs or short one-off tours towards the end of this year and the beginning of next year. It’ll be a couple of gigs here and there, and then we’re going to entertain any offers. We haven’t had any forward yet, but people who are potentially in the position to make things happen have asked us if we would be interested, so we have said; “Absolutely”. Would those potential shows see the band coming to Europe, or are they more likely to be USA based? I think we’d be more likely to be Europe based, to be honest. The reason is, for one thing, Viv never toured with the band in Europe, and Riverdogs did a number of Europe tours after he left the band and Nick switched over to guitar. It’s probably more pockets in Europe; The Netherlands and Germany and probably Spain, and yes, hopefully the UK, and of course I’d imagine Viv would love to play in Ireland with this band. Like this interview? Like us on FaceBook and follow us on Twitter for regular updates & more of the same! Riverdogs' 'California' is out now, via Frontiers Records. 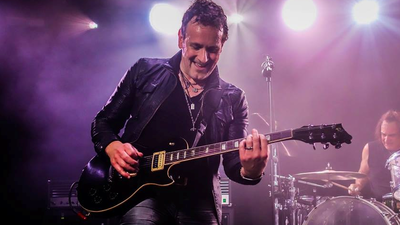 INTERVIEW: Vivian Campbell Talk Candidly About His Dio Days. 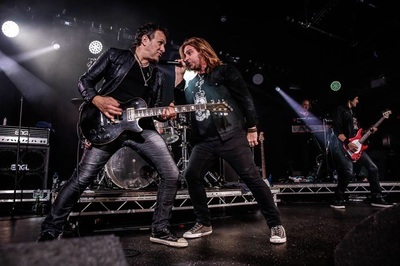 Belfast Last in Line As Vivian Campbell Ends Tour in Hometown.